Max-D trigger: Reference to triggers first used on the Max-D line. These triggers make a clicking noise, are often stiff, and the click must go for the valve to open. When pulling such triggers, a system of random stuff inside snaps open a ball valve. This system allows for trigger-like feel and speed, but the ball valve allows more direct flow than the older valves do. To open up the FF, get all the screws. Beware of the ones under the Flood trigger. Afterwards, get the nozzle caps. Try to get the screwdriver in, as those caps are composed of 2 pieces. (one outside and one in) Those two pieces are secured by 2 screws. You may be able to pry out the small nozzle's cap, but you'll need to unscrew apart the large nozzle's cap. After that, it's the pump cap. My prefered method of getting through this is using a flathead screwdriver and a hammer. Use these to create a seam that passes through the cap vertically, so that one part of the cap is on one side of the gun and the other part on the other side. Now, the repair. In most cases, the spring(s) is/are the defective part of the trigger(s). If the spring is broken, it must be removed and replaced with something. Find a good rubber band or set of rubber bands, or an extension spring if you can find one. (springs are better but harder to find) One person used rubber bands for braces from an orthodon'tist. Study the Max-D trigger well, play around, and see how it works. In some situations and guns, a different piece could be causing the problem. (as it was in the case of my friend's Max-D Secret Strike) If that's the case, reinforce and glue it up. For me, my main trigger's spring broke up while the Flood trigger's spring weakened and often would lock up and not pull. I reversed the spring on this one and that fixed most of it, while adding rubber bands actually did not help. (nor did replacing the spring with rubber bands only) Even though it fixed most of the problem, whoever is using it still needs to pull the trigger fast, otherwise it'll lock up. 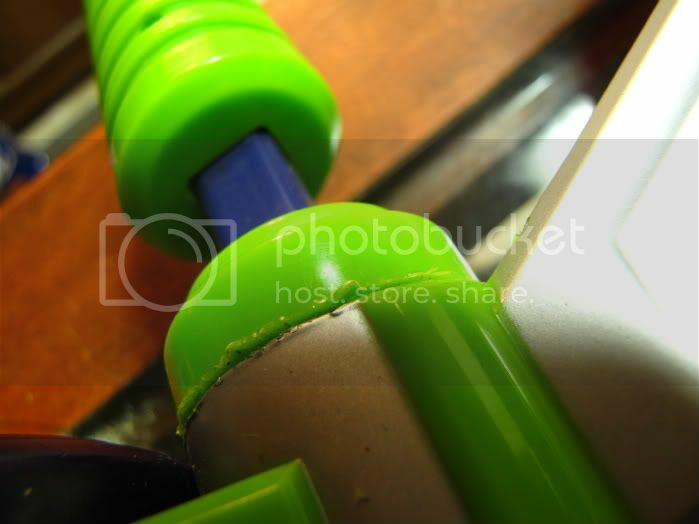 A lockup will occur anytime the elastic part (rubber band or spring) is too weak, mispositioned slightly, and/or isn't contracting fast enough. Lockups can sometimes be prevented if the trigger is pulled directly and fast enough. (for the flood trigger, I had to put my hand on where the connection to the Max-D system was and pull fast to prevent a lock-up) However, avoid pulling any potentially problematic trigger too slowly. Here are some Flash Flood internal pics. Looking through other threads will often be helpful too. 3/21/10 important update: This applies to ALL ball valves; water warriors, Max-D, whatever. When all spring replacements and attempts fail, one crucial solution I overlooked was lubrication. Lubrication of the valve fixed two of my water guns already and I'll be sure to try it in the future. My Flash Flood which has been sitting around waiting for a repair for years has a perfectly working riot blast now, despite the fact that the spring is very worn out and old. Unfortunately, this won't fix your broken springs, but for springs that seem to have worn out, lubrication can help a ton, stopping the notorious stuck valve that does not always close when the trigger is released. What lubricants should you use? The one you select obviously must be safe with plastic but it's not a bad idea to check that it's also safe for rubber. (since you may use it for pumps as well) I recently picked up two types of silicone lubricants: a heavy duty silicone spray and a non-toxic silicone grease. The spray comes with a well needed straw for those hard to reach areas, but the grease is perfect for pumps and Flash Flood riot blast valves. You will have to disassemble the Max-D mech to fully lubricate the valve; rub some grease on the exposed part of the valve when closed, then roll the valve around to spread it. Don't worry that the valve only turns halfway; it will spread if you roll it back and forth enough and apply more when needed. The grease should also work on homemade valves. (though previously an older silicone spray I tried slowed down one of my PVC valves; beware of the stuff you pick and ask people at the hardware store for help) I would highly recommend silicone grease as an alternative to vaseline since it creates a good protective film that does not get sticky or annoying. Silicone grease is also applied by hand. Update 6/19/10: Well, my second Flash Flood's riot blast valve has had the same problem too. Silicone grease did not help the valve move faster this time, so I went ahead and tried the spray. It worked very well so you'll have to choose which lubricant to use for each situation. Last edited by C-A_99 on Sat Jun 19, 2010 4:13 pm, edited 1 time in total. Thanks for writing up the article! It should be much easier to link to it than to have to rewrite everything for each thread. I should also note that readers should use the search feature to take a look at similar threads if more information is desired. The open trigger valve repair article does offer a good bit of information on these repairs in general. However, as C-A_99 mentioned, the Max-D system is designed to snap open after the entire trigger pull and snap closed after you release the trigger completely. That seems to wear down the spring much more quickly. I believe somebody suggested disabling the Max-D trigger system and connecting the trigger to the valve directly. However, I've forgotten who said that, and I don't know whether or not the plan was executed. I thought of doing that before (direct trigger replacing Max-D system, probably never mentioned it though) on the Max-D Secret Strike, but never found anything that would fit through. Ok, after a year, that very same FF is still having trigger problems and I've still been working with it, trying various combinations rubber bands and springs. I read up on an article on how to de-Max-D it and the procedure is very simple for the trigger. I just de-Max-D'd =p mine, tested it and it seems to be working out fine as well. However, I'm currently having some trouble de-Max-D-ing 0_o the larger trigger. What I currently have in mind is to get some kind of arm on it, and have the big trigger get pushed forward instead of pulled backwards. I doubt anyone has done this before. Here's a pic. You'll notice that I had to replace the screws for the smaller valve area since the old stuff wouldn't hold on and broke the thread. I simply tapped the new threads with the new screw and a drill w/ a screwdriver in it. Anyway, good luck with the Flood trigger; I'll try and repair mine too, and I'll let you know if I come up with anything. Hey, that's similar to how I solved the trigger spring problem. I suppose I should cross that off our list of achievements. It seems mainstream. Could you give a link for the article about de-Max-Ding a valve C-A? I think I missed that one. It sounds like something worth trying if nothing else works. "a system of random stuff inside"
hey CA 99, did you copy this directly from the patent application for the trigger? I like the idea of better lamination and all, but jebus! I've had to mess around with like 3 of these damn things, and the third I'm selling broken cuz I've given up. Hahaha, I just wrote it like that for the sake of simplicity. I didn't know what to call it anyway. I should update this guide to include bringing broken Max-D springs to the hardware store so they can help you find a new and improved one. Unfortuantely, I have yet to do this myself but I've heard of others being successful with this. I'll update once I verify it as a good solution. An in-depth how-to would be great, since it seems to be a common problem, particularly with Flash Floods. So tonight I finally decided to tackle my broken Flash Flood. I got as far as that end cap for the pump. I guess the only way to get through it is to cut it in half? Just got a crazy idea: could you use a low-torque CPVC ball valve? They are actually quite thin, so they may just fit onto the existing pipe. There's no point to replacing the valve unless it's leaky. That said, I should look into soakernerd's idea for my leaky Max-D 5k valve but that's off topic. Your Max-D system could be a pain to fix. 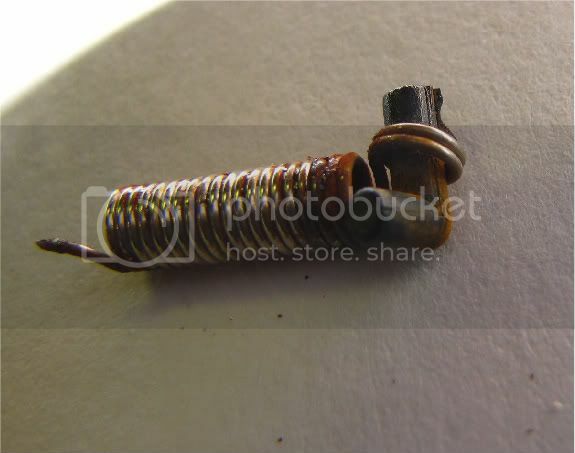 When mine broke, only the spring tore off, but it looks like you'll have to fix the nub that holds onto it as well. You may be able to fix it by drilling a small hole and tapping a screw through it. (hole should be correct size and you may not have to drill it all the way through) I can't think of any solutions other than this at the moment. But to open up the blaster, you'll indeed have to cut the pump cap along the plane where the casing splits in half. A dremel may be unsafe and damage other parts, but using a hammer and relatively sharp flathead screwdriver can open it. (though it's quite tedious and you got to be careful) It may also be possible just to pry the cap a ton and force all the glue off without ever cutting anything. That looks pretty hopeless, unless you can get another piece from another Max-D system gun. I would suggest doing the repair/modification that I did to my Arctic Blast to fix it. I don't know if it's the proper way to do it, but what I did was completely disassemble the "system of random stuff." Then I opened the valve and superglued it in place so it couldn't close. Then I put a new ball valve in front of it (I also added a screw-on nozzle selector so I could use different sized nozzles). Now you have to use it like a homemade, but at least it works. What I did was heat up my exaco knife with flame so it got red hot, then carefully cut through it. I used a piece of metal (a utility knife blade) and placed it in the gap between the cap and the pump arm so as not to melt it. Worked like a charm. C-A_99, that's exactly what I was thinking of doing..tapping a small hole and putting a small screw through it. In theory it should work, the plastic looks strong enough, and I can reinforce the stress area buy putting some plastic epoxy around it. However, before any of that, I fear I may have a second problem. With the gun open, I closed the nozzle manually and did a pressure test. Whenever I pump it, I can hear the sound of air coming from the Flash Flood nozzle, but I can't seem to find where. When I open the FF nozzle it stops...so perhaps it isn't closing all the way? It doesn't appear to be building pressure.